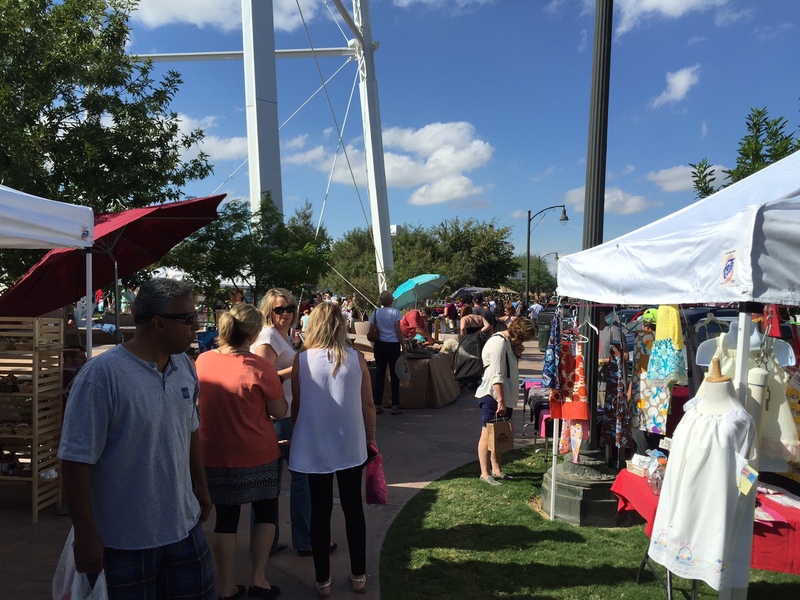 Market Spotlight: GILBERT ART WALK! Last time we were chatting about the local art markets, we were spotlighting the Downtown Phoenix Public Market. This time, let’s trek over to a neighboring township, and see what the heck is up in Gilbert, AZ. According to Cheri Montgomery, Owner/Operator of the Gilbert Art Walk, there’s A LOT happening…. at least there is every 1st & 3rd Saturday! Ever since it’s inception in 2011, the Gilbert Art Walk has featured one-of-a-kind woodworking, ceramic, jewelry, paintings, photography, handmade children’s clothing, and more; live music every event(! ); and a community information table that contains flyers and coupons for happenings in the area. I was a vendor at the art walk and the previous owner closed the business after one season… so I decided to take over and reopen it. It has taught me confidence. I was able to go outside my comfort zone and work with the city. Also, I have had to think quickly on my feet and come up with solutions to challenges in a fast-paced environment. I pride myself in going above and beyond to help build confidence in new artists that have never sold their art before, and that’s my greatest reward: seeing a small business expanding! Her main challenge? Like we’ve heard from many arts fair organizers– space! Finding that you have more interest than square footage AND then figuring out where each booth is placed…it’s a lot of tough decision-making and a lot to manage. Especially as the holidays approach and she’s also arranging some amazing extras: performers from both The Nutcracker and the Renaissance Festival will be on-hand to stage small excerpt performances for the Gilbert crowds! Cool, uh? Montgomery recommends that shoppers continue to come back, again and again. There are new artists at every event and established artists are always bringing new products. There is also a lot of opportunity to find an artist to do custom work! And because of all the regulars, her advice for artists is to do at least do three shows in a row– because when customers say they will return, they generally do. You’ll definitely see US there! Make sure to swing over and say hi! If it’s your first time there and it’s because you read about it here, make sure to tell us! We love hearin’ that these lil’ ol’ blogs of ours are gettin’ the word out! Posted on November 14, 2014 January 3, 2015 Categories EventTags arizona, art, art walk, artisan, az, craft, farmers market, gilbert, gilbert art walk, handmade, local, market, phoenix, Practical Art, public marketLeave a comment on Market Spotlight: GILBERT ART WALK!